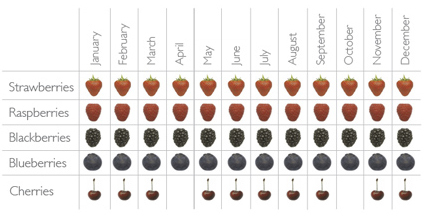 Berries were once available in the UK during a very short domestic season during the months of June and July for strawberries and raspberries, and August for blackberries. We have worked hard to extend the season of our UK production and now produce strawberries and raspberries from May to October, and blackberries from June to September. British blueberries are now also grown from mid June to September. However our British growers cannot produce berries or cherries which taste of summer in the late autumn, winter and early spring, and this is where our overseas partners and suppliers come in. Berry Gardens has close links with the very best growers in all the key non UK season supply areas. We have worked hard to ensure we forge relationships with like minded growers and groups who share our values and our passion for quality. Offering year round supply of all berry and cherry types, we now look to differentiate our offer using the very best eating varieties. All this hard work means consumers can enjoy great tasting and healthy berries whenever they want to, and at good value too. Authorised Economic Operator Status is an internationally recognised accreditation that indicates a company’s role in the supply chain is secure and reliable, and that any Customs controls and procedures are efficient and compliant. It is important to note there are two statuses – AEOC (Customs Simplification) and AEOS (Safety and Security). Berry Gardens Ltd has obtained AEOC status as recommended by our Customs Advisors. Both AEOC and AEOS are recognised statuses across the EU that should make it easier for businesses to apply and use simplifications across the Union. It is also an industry ‘Kite Mark’ and a useful marketing tool. Why did Berry Gardens apply for AEO status and what are the benefits? One of the options highlighted by the UK government to help reduce the predicted risk of delays at the borders post Brexit is the AEO certification. Post Brexit, AEO certification will become even more desirable as an internationally recognised tool to keep cargo moving. Greater access to priority clearance, meaning that non-certificated organisations will be dealt with as a secondary concern. Fewer delays at Ports resulting in import and export products being shipped faster to the end consumer. Quicker access to certain customs procedures. What process did we go through to achieve AEO status? As part of the application process, HMRC officials assessed Berry Gardens’ finances, procedures and processes across all departments and compliance with customs requirements.